This is the cottage that you will want to rent again and again!!! This is the cottage you will want to rent again and again!!! This cottage is in a PRIME Central Location that is 2/10 of a mile from orchard boat launch. 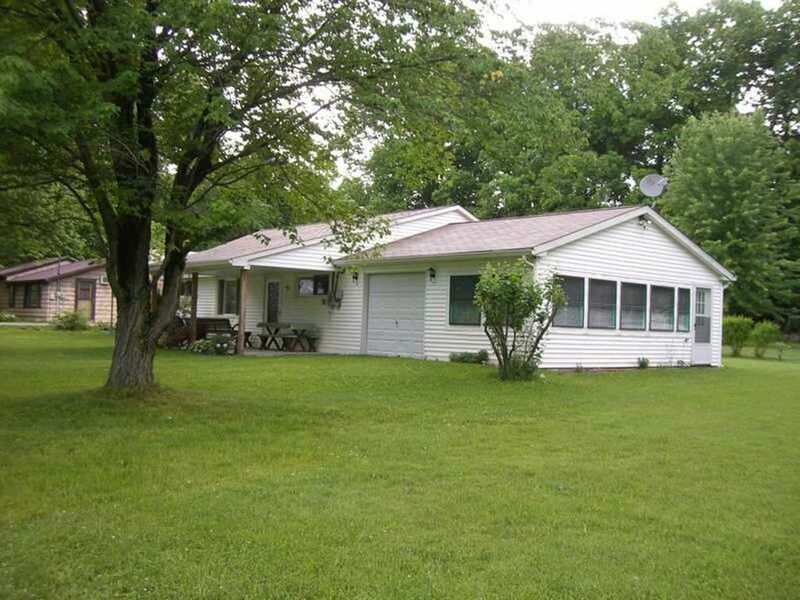 This cottage location gives you access to all the best that Pymatuning Lake has to offer! Fishing, boating, swimming, biking, hiking, golfing, or visiting the local wineries! Or, take a trip to the famous Spillway to feed the fish and see the fish hatchery. The deer park is nearby too! Enjoy the fireworks at the Dam or see one of the local festivals or the annual regatta. Lay on the beach or enjoy some nearby indoor and outdoor swimming pools. The cottage features ALL UPDATED MATTRESSES IN BEDROOMS queen size bed in the Master bedroom and in the second bedroom with a twin sleeper sofa, the sun room is also used as a third bedroom with a queen size futon and the living room has a queen size sleeper sofa. The kitchen comes fully equipped with dishes, cups and silverware and all the amenities of home. The laundry room has a full size washer and dryer for your convenience. There are plenty of places to enjoy your meals with an eat in kitchen, sunroom, a picnic table on the front covered porch and backyard patio dining area where you can also grill all the family’s favorites on the gas grill. Later, enjoy the evening making smores sitting around the campfire ring under the stars. And for those warm summer nights cottage is equipped with air conditioning. This cottage is never short on fun for a stay and play day. The cottage comes with two flat screen TV’s and a DVD player. Enjoy cable, WiFi, or Netflix for watching a great movie with everyone. There are outdoor yard games like volleyball, badminton, and corn hole. Or you can stay inside and play cards, a board game, or have fun playing a game of darts in the garage. PETS ARE WELCOME BUT PLEASE CONTACT OWNERS PRIOR TO BOOKING FOR FURTHER DISCUSSION. What made us purchase this home is when we immediately walked into the front door we felt this was the home away from home that we were looking for. It has that home feeling but with the cottage taste. The location of this to the lake was just where we wanted be. Also the cottage has all the modern conveniences as well as updated windows, roof, furnace and furniture. We had a wonderful time. Enjoyed site seeing and relaxing. We really enjoyed our stay in this cottage, It was quiet, comfortable and well kept. Took the kids fishing, to the spillway, and deer park and they enjoyed themselves. We had 6 children (ages between 5-14) with us and all are asking if we could come back soon and do it again. Also had very cute shops in the small town in Ohio across the lake. Thank you Quinn and Jon for a great stay in your rental! We really enjoyed our stay your cozy little cottage. It has everything you need. And I mean everything. My husband enjoyed all the fishing opportunities. He caught several nice sized bass. That always makes a fisherman happy. Another great thing. So very quiet. Loved that. The cottage is located very close to the lake and is on a corner lot. There is a BBQ area and fire pit for outdoor enjoyment. The cottage is very clean and has all of the necessities including kitchen supplies, beach & bath towels, board games, pillows, etc. we were very comfortable and would recommend it to anyone coming to the area for a visit. The house was wonderful. Very close to the lake and local attractions. The house was clean and very well stocked with everything you could think of---even spare toiletries in case you forget something. The porch provides a nice outdoor shaded area and was where we spent most of our time. The firepit was nice as well--and the neighbor was friendly and very helpful. Overall it was a very nice house, we really enjoyed our time there!